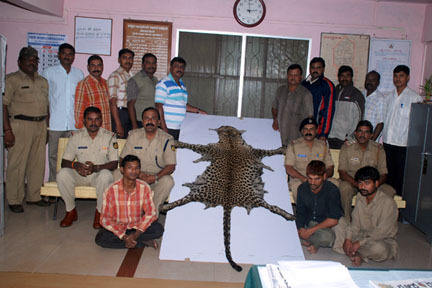 The Khade bazaar police on Wednesday arrested three persons on the charge of possessing panther skin worth Rs. 1.5 lakh. Arrested are Jenish Korad Ipoorna alias Jurio Naik (27) of Chandragiri of Andhra Pradesh, Kallappa Dundappa Latti (30) of Netaji Galli in Belgaum and Bahseer Ahmed Babasaheb Sanadi (25) of Pant Balekundri.